Braise garlic: Place garlic in a small saucepan and cover with olive oil. Add rosemary and bay leaf. Simmer on low until garlic is soft. Take off the heat and set aside. Drizzle all vegetables with olive oil, salt and pepper. Place in a baking dish and roast in oven until browned. Some veggies will cook quicker than others, so you’ll need to monitor them. Roasting will take 20-40 minutes. The onion will cook quickest, the peppers will take the longest. When the vegetables are browned, remove them from the oven. When veggies are cool enough to handle, begin stacking in this order: Place red pepper on the bottom, followed by eggplant, zucchini, pattypan squash, mozzarella, whole basil leaf, and onion. 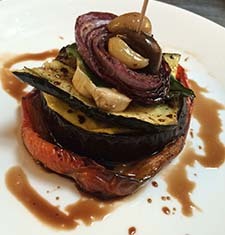 Skewer two mushrooms then insert skewer into veggie stack. Top each stack with 1 tbsp. garlic oil, 2 cloves of braised garlic, and a drizzle of balsamic, or to your liking. In addition to being a Spirit Rock retreat cook, Alaina Barron is the founder of Barroness Home Chef, a personal chef service in Marin and Sonoma counties. Visit Alaina's website for more information, www.barronesshomechef.com or send her an email at barronesschef@gmail.com. If you share or republish this recipe, please credit Alaina Barron as the recipe's creator. Thank you!